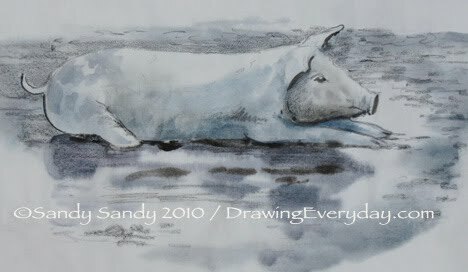 I couldn't wait to get back to this little piggy sketch, so here is my interpretation of this week's sketching challenge. It looks like I'm the only one doing them anyway. I might as well discontinue them if nobody is interested. Ooh, I am definitely interested in doing your challenges! I just recently found your blog and love your artwork. no, please don't discontinue them!!! i'm interested!! i just did my first sketch... the pig sketch, but haven't uploaded it yet. i'll contact you when i do.